Dr. Leanna Huard obtained her undergraduate degree from the University of San Diego and attended medical school at Albany Medical College in Albany, New York. 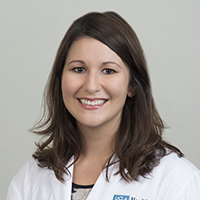 She completed a combined Internal Medicine and Pediatrics residency at Loma Linda University Medical Center and completed her fellowship in Pediatric Critical Care at UCLA Mattel Children’s Hospital. She is currently an Assistant Professor of Pediatrics. Dr. Huard’s research interests include end of life care and perceptions of futility within the ICU.